Saint Joseph High School was founded in 1915. We are a Catholic High School located in Natrona Heights, PA above the scenic Allegheny River Valley. 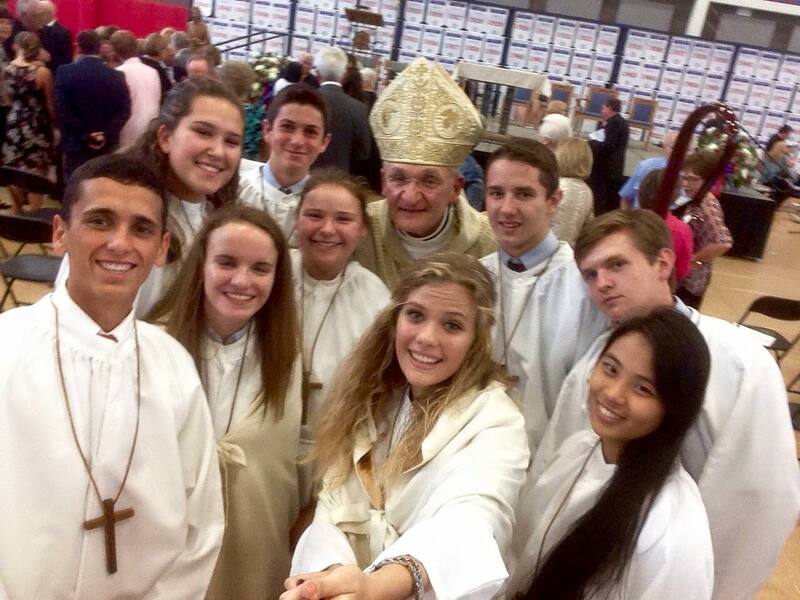 We are the oldest Catholic high school in the Diocese of Pittsburgh. Saint Joseph High School currently educates 170 students from 2 dioceses, 44 parishes, 4 counties and 21 school districts. We are accredited by the Middle States Association of Colleges and Schools. Saint Joseph High School has been educating students for over 100 years in academics, the arts and athletics. We regularly turn out National Merit recognized students, National History Day winners, award-winning theatrical productions, WPIAL championship basketball teams – and solid citizens. In fact, Saint Joseph High School is the only Pittsburgh Diocesan high school to be named a School of Excellence (formerly named Top 50 Catholic High School) in the Nation since 2006. We believe that each person is called to spiritual and moral growth which is the ultimate goal of all curriculum and programs. Through an understanding of the Gospel message and active participation in Liturgy and prayer, each student is encouraged to grow in relationship with God and neighbor. We believe that each person is called to make the Gospel visible in the world. Through an assimilation of the Church’s social teachings and recognizing the dignity of each human being, each student is invited to work to build up the Kingdom of God. We believe that each person is called to act with integrity. Through the teachings of Jesus Christ, each student is challenged to act with truth regardless of the consequences. We believe that each person is called to continuously seek truth, information, and knowledge. Through a college preparatory program that encourages academic excellence and challenges students to think critically and creatively, while at the same time remaining flexible enough to meet the educational needs of all, each student is motivated to take ownership for their own learning and seek solutions to life’s problems in the light of Christ’s teachings. Saint Joseph High School has been named by the Cardinal Newman Society’s Catholic Education Honor Roll as a School of Excellence (formerly known as Top 50 Award) every year since 2006. This recognition highlights excellence in academics, civic education, and Catholic identity. For 100 years, SJHS has been mission-driven—preparing students for college, life, and heaven! Saint Joseph High School is grounded in the Gospel truths of Jesus Christ. In a community that respects each student as a Child of God, we offer a college preparatory education that encourages spiritual growth, academic excellence, co-curricular participation, and civic engagement. Our Mission is to graduate men and women whose lives are rooted in our core values of Sanctity, Justice, Honor and Scholarship. Saint Joseph High School is a Catholic School which believes that human beings are created in the image and likeness of God and therefore have inherent individual value and personal worth. This belief creates a well-defined moral environment of mutual respect which is necessary to educate the total person in the Catholic tradition — a tradition which believes that education enlightened by the wisdom of Christian revelation can be fuller, richer and more humane than any other kind of education. Saint Joseph High School exists as a partner to parents, who have the first responsibility for the education of the child, so that adolescents may engage in the process of identity formation, secure in the knowledge that home and school share the same commitment to the Catholic Church and its teachings and to the value of personal responsibility and initiative in all areas of the curriculum. Saint Joseph High School is committed to providing an atmosphere in which each student prepares not only for further formal education, but also for lifelong learning. Saint Joseph High School strives to provide its students with the opportunity to see themselves and those in the world around them as integral members of the Mystical Body of Christ so that the awareness of the struggles of any portion of mankind will prompt their active participation in meeting the challenges of building a just society in the spirit of Jesus Christ.